Dear heavenly Father how we thank and praise You that You have watched over us both today and brought us home once again after our busy days, so that we may we unite together in love.. and join together in prayer and praise – and in joyful thanksgiving for all that You have done for us today.. Thank You Father for all Your goodness and grace to us, and for the wonderful way that You have guided us in our various jobs and duties today. Help us to settle down for the night with worries cast onto You, in the knowledge that Your grace is always sufficient for our need. Thank You Father for this lovely opportunity to abide in Your love as we rest in each others arms and pray that we would enable us both lie down in peace, to rest in safety and to sleep soundly and securely, knowing that You are our ever present help – our fortress and the rock of our salvation. 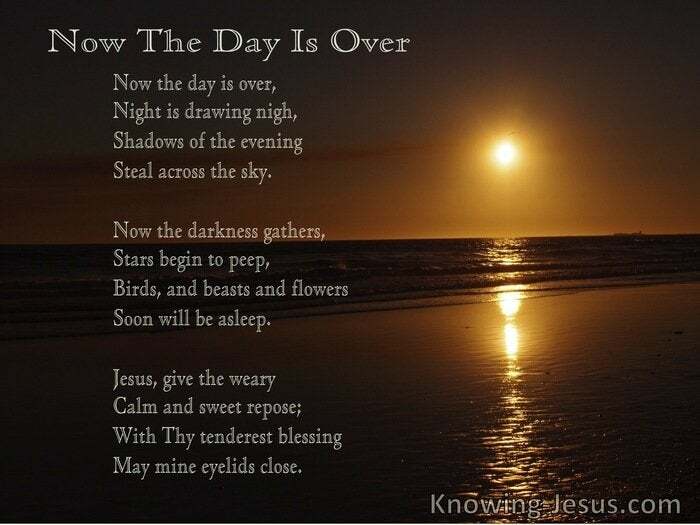 Father, as we come to the end of another very busy day, we praise and thank You for the gift of sleep and the wonderful way that the night-time hours seem to sweep away all our cares.. and melt away all our worries, as we rest in You. Thank You that we may confidently cast all our cares and concerns upon You and lay all of our burdens down at Your feet – knowing that You love us with a perfect love and care for us, with Fatherly concern. Protect us we pray, through the hours of darkness, knowing that there are many danger and much wickedness that may stalk outside our home – but thank You that You are our shield and protection – our rock of salvation and our hope and strength. Purify our mind, comfort our heart, soothe our soul and give us all a good nights sleep we pray, – for we are Yours, and You have promised that You would give Your beloved children refreshing sleep and rejuvenating rest in the night-time hours. May the angel of Your presence, who is the Lord Jesus Himself encamp around us tonight and protect us under the shadow of His wings. Loving heavenly Father as the night is fast approaching I pray that as I climb into bed I may rest my weary soul in You and allow all the business of the day to melt away. 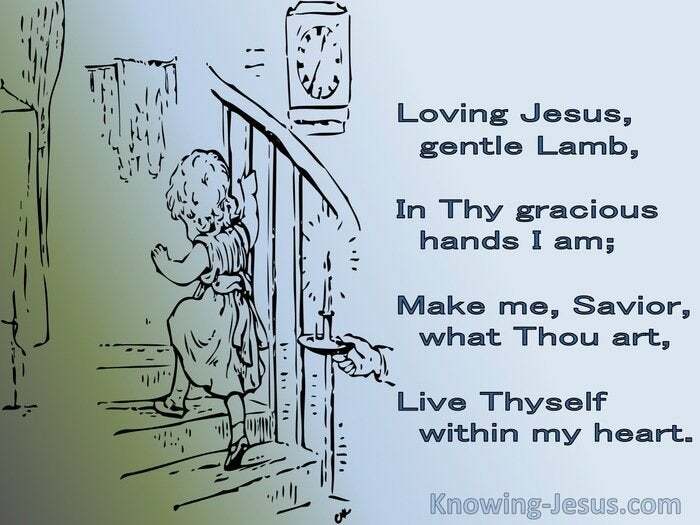 Help me Lord to find my rest in You and as I keep my heart abiding in You. Lord so many things are changing in my life and at times I feel so lonely as those that are nearest and dearest to me have been taken from me to – for one reason or another…. Lord I know that You have promised to be with me every moment of the day and night – but somehow the night time makes me feel more on my own. How good it is to praise You Oh my God and what a great and mighty God You are. You are worthy of all my worship and deserving of all my praise and I thank You for all You have done in my life and for keeping me safe throughout this day. Dear Lord Jesus, thank You that You have kept me safely through another day. Forgive me Lord for the wrong thoughts and attitudes that I have allowed to trouble my mind today. Forgive me Lord for the times that I have allowed pressure to take away the perfect peace I have in You. 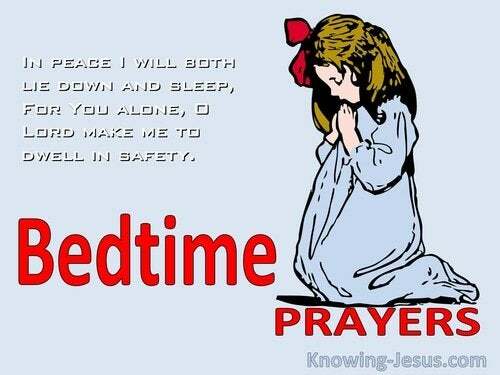 Lord – I hand the irritation of the day over to You and pray that I may rest quietly in Your loving arms and not permit any of these daily pressures to affect the refreshing sleep of peace - that You give to all Your children. Give us all a peaceful night sleep we pray - and Lord, we love You and praise You and thank You for all that You have done for us – and most of all for sending the Lord Jesus Christ to die for us on the cross.. so that we might be forgiven of our sins and receive Your free gift of eternal life.. for which we are eternally grateful. Loving Father, thank You Lord, for being with me throughout today and for Your hand of blessing on my life. Thank You for the way that You have led and guided me throughout this day and I pray Your loving grace would rest on all that I have done – may it be to Your praise and glory. 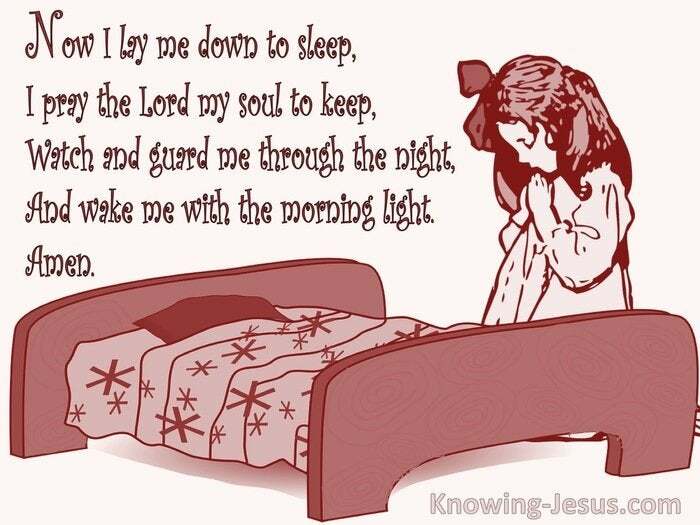 Loving Lord You are my strength and my sufficiency and I pray that as I settle down for the night that You would enable me to drift into a deep and quiet sleep and a peaceful rest. Remove any little tensions that may have built up over the day so that I may wake refreshed in the morning and ready and willing to do Your bidding.